We made it! We are on the last stop on Leg 3. It's difficult for us to imagine since this leg has provided several challenges along the way. Conni and I both will turn to each other and say, "We're in La Paz?!" We need to find a home for Wings, preferably on the hard, strip her of gear for storage, and enjoy two weeks at Playa Grande in Cabo San Lucas. Reports of heavy snow in Anchorge leave us in disbelief. 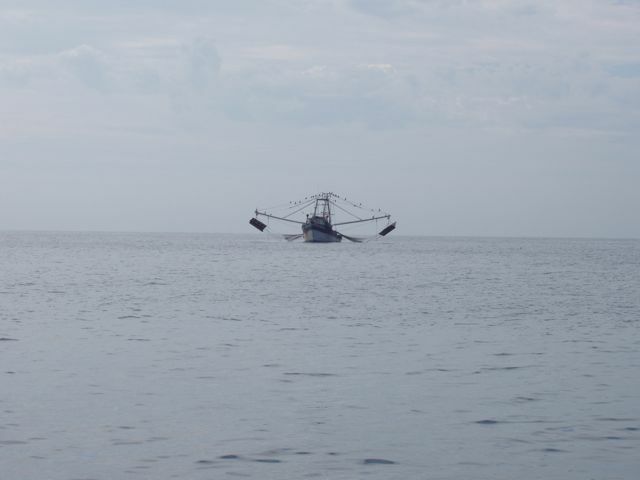 As we lay at anchor near San Jose del Cabo, this shrimp boat dropped anchor near us. 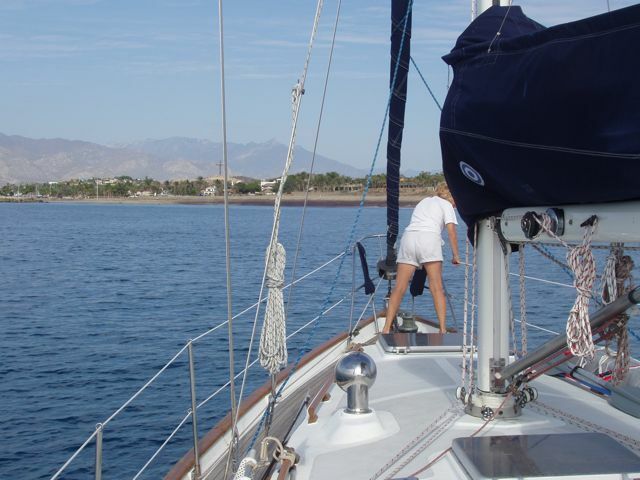 Conni prepares to hoist the anchor from San Jose del Cabo. 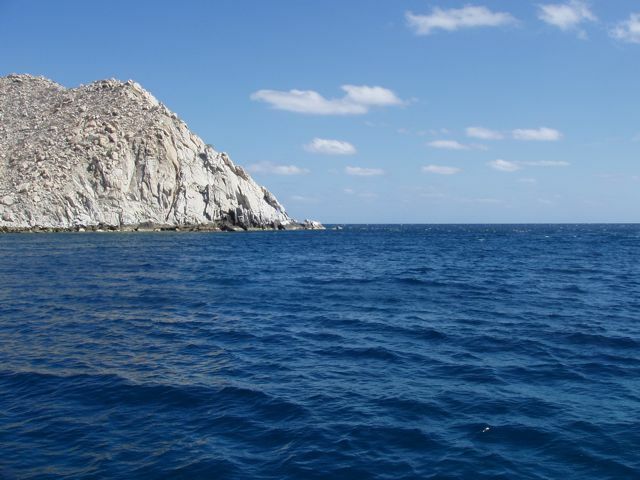 The rock entrance to Bahia Los Frailes. This rock outcropping provided a bit of protection from the heavy North wind blowing from the US "Four Corners" area. 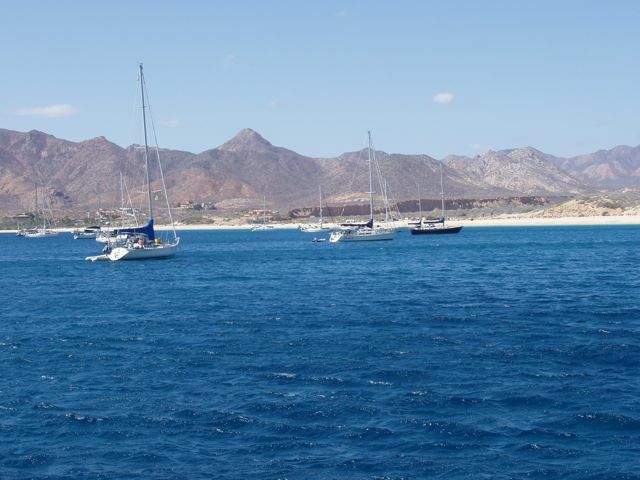 The fleet anchored off the lovely beach at Bahia Los Frailes. 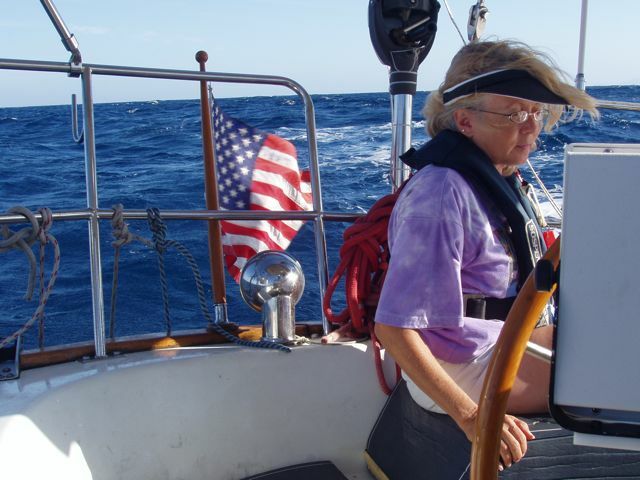 Conni at the helm in high winds. With the wheel locked, our Hydrovane does all the steering. Our dodger window encrusted with sea salt. It's not water! 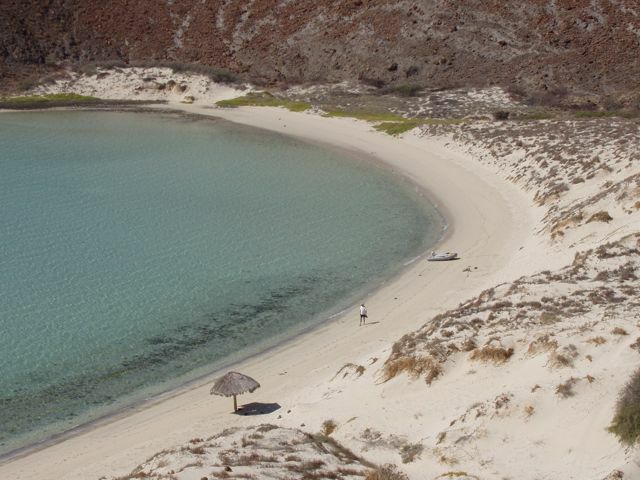 The Sea of Cortez is saltier than many bodies of water and the heat dries the water quickly, leaving enormous deposits of salt on everything. Items that never rusted in Alaska are beginning to rust here. Our flags through a salty window. 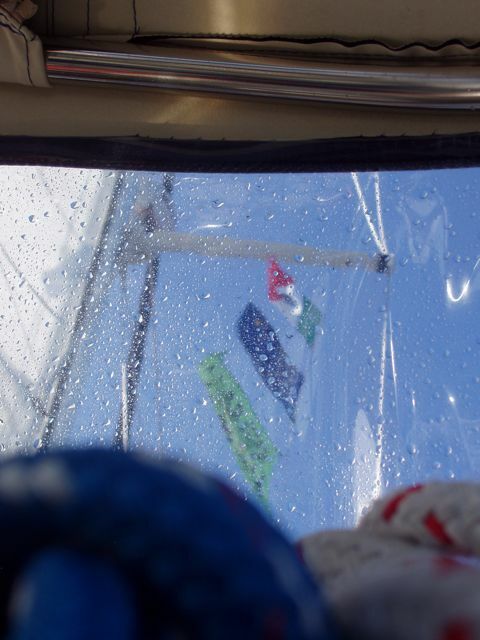 I was lying in the cockpit, looking up at the fluttering flags and snapped this photo. The flags are a Mexican courtesy flag, our Alaskan flag, and the Baja-Haha flag. The photo could also be called, Billy's World. 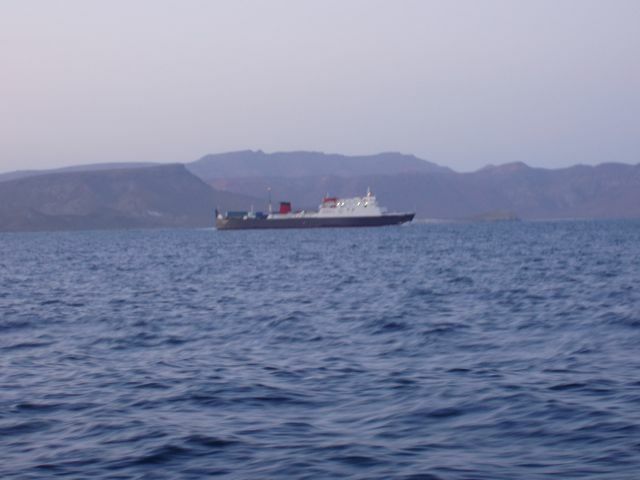 Entering Punta Coyote and the Canal de San Lorenzo. This is very shallow water with reefs on either side of the channel (Canal). We waited for this Mexican vessel to clear the Canal de San Lorenzo before proceeding through ourselves. There was room for only one of us and this vessel obviously had "tonnage rights". 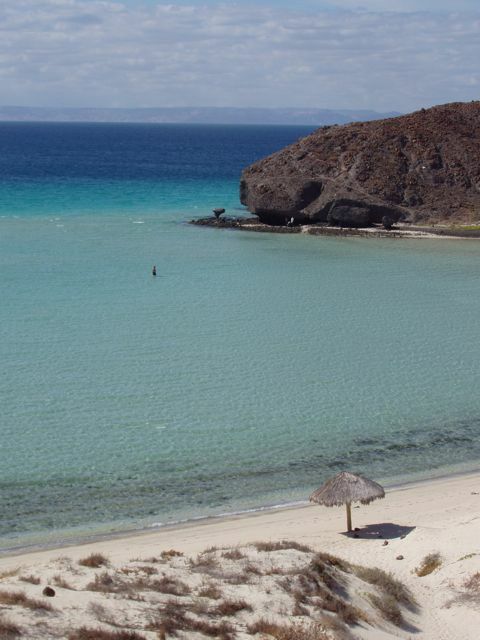 After arriving in Bahia de Balandra, a few hours south of La Paz, we enjoy our well-earned evening relaxation. Conni prepares for hors de oeuvres and cocktails. Happy Conni! 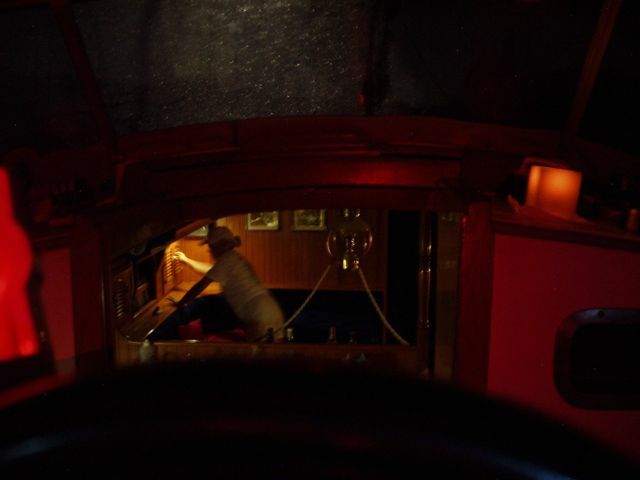 In the cockpit, we are enjoying the beginning of a not-so-peaceful night. 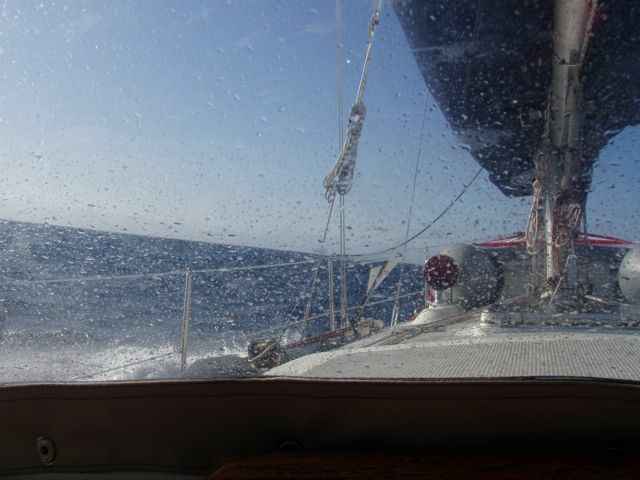 You would never have guessed from this photo that the wind increased and we fought a dragging anchor for several hours. 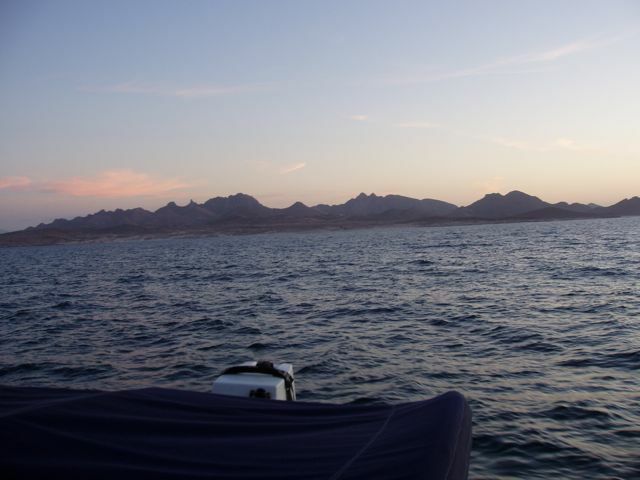 Cruising in the Sea of Cortez! 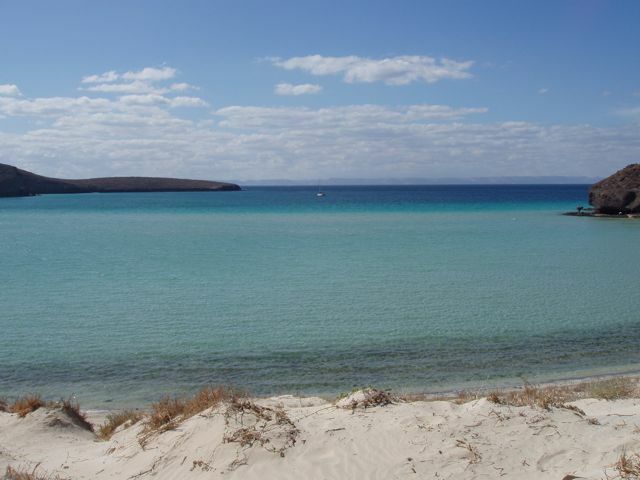 I'll bet that this beach has been photographed a million times for cruisers' sites: Bahia del Balandra. It earned another photo with its stunning beauty. 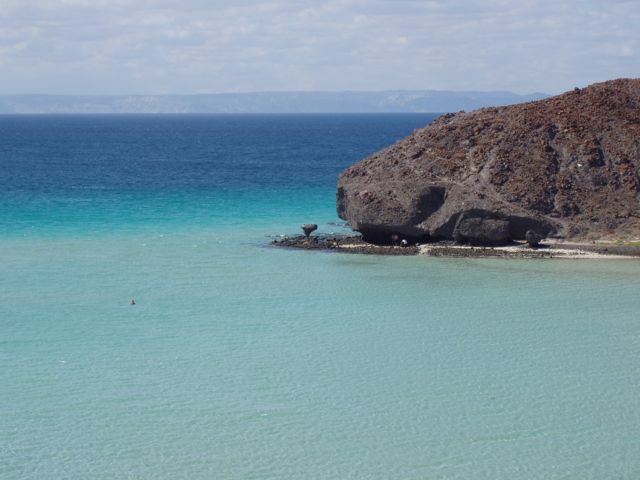 The oddly shaped rock on the point at right is "Hongo de Balandra" or "The Balandra Mushroom ". Wings is the speck in the deep water, dead center, where she has earned the right to be. The water is warm but not hot, the sand is like white flour. El Hongo de Balandra, a local landmark. The geology seems to be pyroclastic and some internet searching confirms our observations. All this is the same kind of cooled volcanic debris that destroyed Pompeii. Interesting! Baja California is on the Pacific tectonic plate while the mainland is on the North American plate: the two are moving apart. 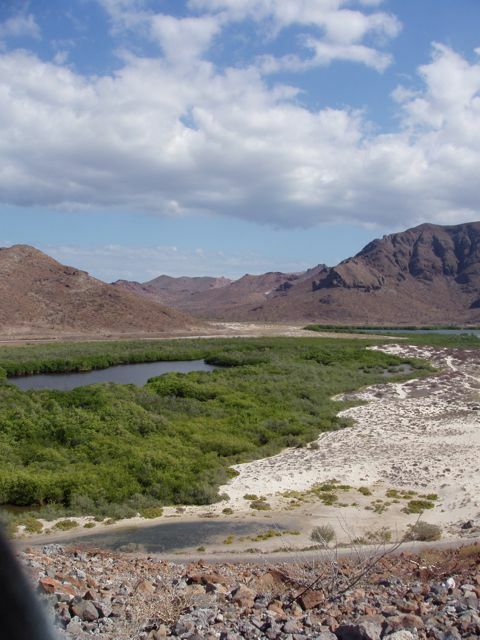 Only the enormous delta created by the Colorado River has saved the Imperial Valley of California from being flooded by the waters of the Sea of Cortez. A small palapa on the beach. A mangrove area just north of the beach. All this is volcanic. Bill strolls toward Conni who has boldly climbed up for a better view. Bill was snorkeling in the shallow, warm water. Our dinghy is mid-photo. 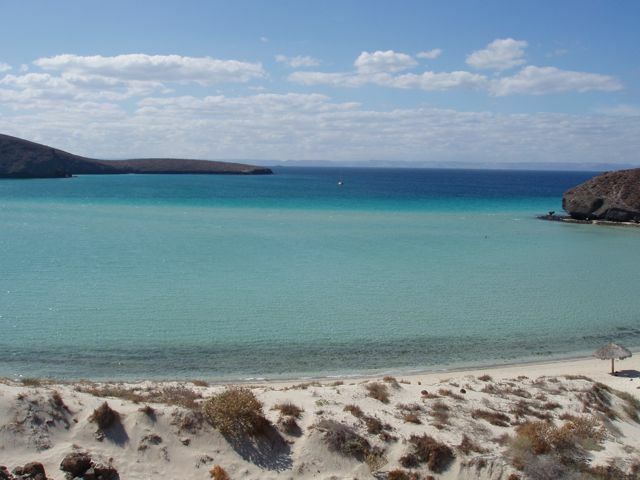 Lovely Bahia de Balandra. Wings is in the distance but always in the middle. Slitherin'! 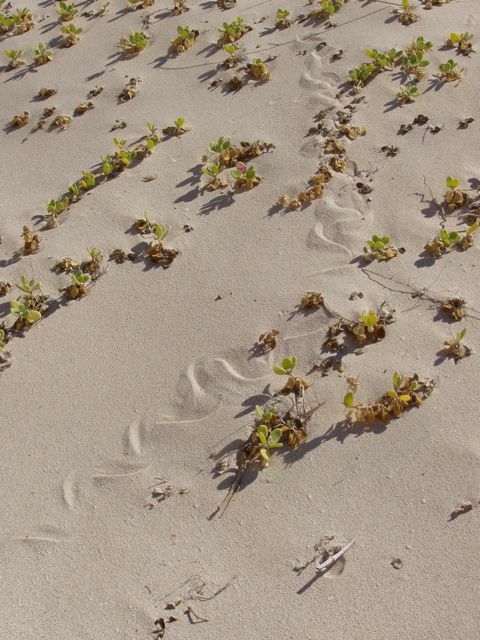 A snake's path in the flour-like sand makes a cool pattern. 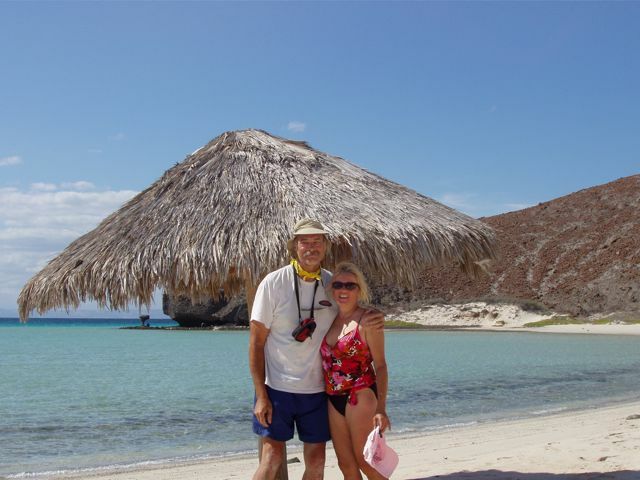 Bill and Conni on the beach in Bahia de Balandra. A typically kind and thoughtful Mexican man, part of a couple, offered to take the photo as I struggled to get the camera mounted on unstable rocks. Conni under the overhand near Mushroom Rock. Yes, this is pyroclastic! It looks just like dirt with large basaltic rocks embedded in it. Made me nervous! Every rock on the ground had, at one time, been suspended from the roof. Thank you Peter and Susan! 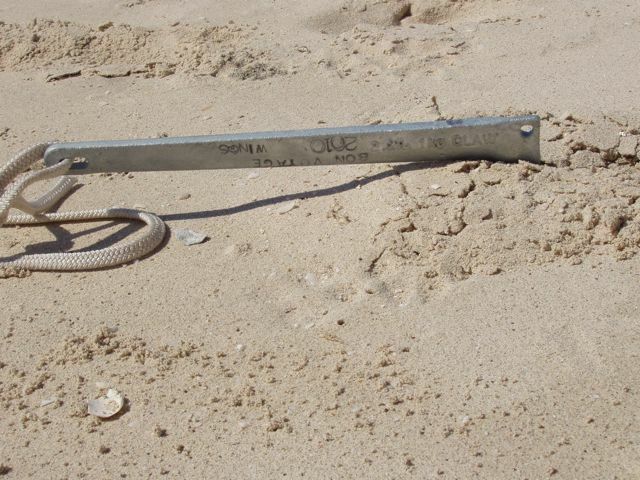 This excellent Bruce anchor was given to us a Bon Voyage gift from our friends. Peter's inscription reminds us of the good wishes each time we use it.